Rurouni Kenshin is an adaptation of the famous Shonen manga of the same name (also known as Samurai X) written and illustrated by Nobuhiro Watsuki. I often watched the anime, which was also adapted from the original manga, during its course on Cartoon Network’s Toonami, and I occasionally read the manga while it was featured in the monthly Shonen Jump, but it has been some years since then, and I’ve had little to do with the series since. Upon this film’s release, I took interest out of a nostalgic curiosity, and I’m quite satisfied to report that this film has reminded me why I loved the show and manga, and would spark interest in near anyone who was unfamiliar with them. 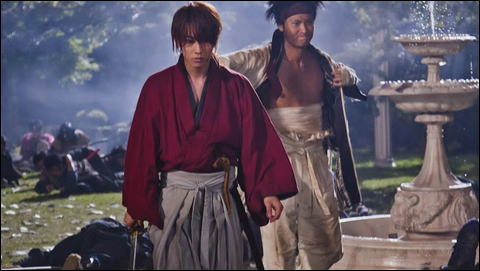 The protagonist of the movie is a wandering samurai, or “Rurouni”, named Himura Kenshin, who is better known by his notorious alias, "Hitokiri Battōsai" from his days as an assassin during Japan’s Bakumatsu War. After the conflict’s conclusion, Kenshin vows to never kill again and spends the next ten years as a vagabond until his past catches up to him in the form of an old rival (now a government official) who attempts to enlist his aid, and a bloodthirsty samurai from the war with the power to paralyze his foes through sheer fear. Kenshin is pushed to his limits as he struggles to protect his newfound friends and allies and overthrow a drug smuggling syndicate, all while staying true to his convictions. From what I recall from the source material, the casting here is satisfactory if not top notch. Takeru Sato (who one may recall from the BECK film) does an excellent portrayal of Kenshin, capturing both his feigned innocence, sincere kindliness, and his intimidating brutality. Everyone else gives good performances as well, while some character’s comic book origins are more evident than others. However, this isn’t a detriment. Half of the film’s charm lies in the fact that though it takes itself seriously (as this kind of story deserves), it never takes itself too seriously. The villains that need to be are silly without being obnoxious, the humor is appealing, and the action choreography is unashamedly over the top at times while still feeling grounded and never breaking your suspension of disbelief. A lot of the strength of Rurouni Kenshin comes from Kenshin’s character himself, and watching his interactions with the world around him as it changes and tests him. Japan in the film is still recovering from a massive change in laws and culture in the aftermath of the war (as the film would constantly remind you in the earlier acts). Naturally, these changes have affected our protagonists in major ways too, in more than physical ways. The film is sure to make Kenshin a vulnerable hero due to his personal code. While he makes easy work of lesser foes, the movie shows how far one’s personal convictions can both take you and restrict you, and makes you wonder what your limitations are as the character’s meet their own. Will we face our pasts and pay for our sins, or allow others to suffer as we hide? Will we disregard the legacy of those who worked diligently in the past for temporary peace, or will we die to protect what we cherish most? These questions are asked, and while some are answered, there is ambiguity left for your own personal judgment. Good review! I want to see this. Thanks, you can find it online, though you'll have to download subtitles separately.